* Note – It’s much easier to grate fresh Mozzarella if you put it in the freezer for at least 30 minutes beforehand (or overnight). 1. Preheat oven to 350 degrees. Combine the squash/pumpkin, garlic and cayenne in a bowl. Combine the spinach, cottage cheese and half of the Parmesan cheese in another bowl. Cook the lasagna noodles according to the package directions, but subtract 2-3 minutes from the cooking time. 2. For the sauce, mix the corn starch in a bowl with a small amount of milk. Once mixed, stir in the rest of the milk. Heat the butter in a medium saucepan until it begins to melt, then add the corn starch and milk. Whisk continually until the milk begins to boil. Add the salt, pepper, cayenne and nutmeg. Lower heat and cook until the sauce thickens, stirring occasionally, for about 5-7 minutes. 3. Using a 9×13 baking dish, pour 1/3 of the sauce on the bottom, followed by 3 lasagna noodles, 1/2 of the squash mixture, 1/2 of the spinach mixture and 1/2 of the pine nuts (if using). Repeat, then top with a final layer of lasagna noodles, sauce, Mozzarella and remaining Parmesan cheese. 4. Bake for 40 minutes, or until the sides are bubbling and the cheese on top is lightly browned. Awesome! Thank you for sharing. I’m sure we can figure out how to incorporate peanut butter in this. How creamy and delish would that be? Will post once we have figured out right portion. Yummmm. I agree! It would go perfect in the squash puree, I’m sure of it! 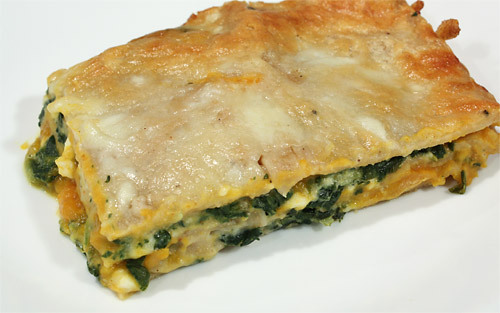 How about a Peanut Butter dipping sauce to go along with this delish lasagna? Um, yeah hi, amazing pb blog, why have I not found you before?!?! I will be web-stalking you for awhile fyi. Hi Heather! Thanks for the compliments. Welcome to my world!